Arabic grammar or Arabic language Sciences (Arabic: عُلُوم اللغَة العَرَبِيَّة‎ an-naḥw al-‘arabī or قَوَاعِد اَللُّغَة اَلْعَرَبِيَّة qawā‘id al-lughah al-‘arabīyah) is the grammar of the Arabic language. Arabic is a Semitic language and its grammar has many similarities with the grammar of other Semitic languages. The article focuses both on the grammar of Literary Arabic (i.e. Classical Arabic and Modern Standard Arabic, which have largely the same grammar) and of the colloquial spoken varieties of Arabic. The grammar of the two types is largely similar in its particulars. Generally, the grammar of Classical Arabic is described first, followed by the areas in which the colloquial variants tend to differ (note that not all colloquial variants have the same grammar). The largest differences between the classical/standard and the colloquial Arabic are the loss of morphological markings of grammatical case; changes in word order, an overall shift towards a more analytic morphosyntax, the loss of the previous system of grammatical mood, along with the evolution of a new system; the loss of the inflected passive voice, except in a few relic varieties; restriction in the use of the dual number and (for most varieties) the loss of the feminine plural. Many Arabic dialects, Maghrebi Arabic in particular also have significant vowel shifts and unusual consonant clusters. Unlike other dialects, in Maghrebi Arabic first person singular verbs begin with a n- (ن). The identity of the oldest Arabic grammarian is disputed; some sources state that it was Abu al-Aswad al-Du'ali, who established diacritical marks and vowels for Arabic in the mid-600s, Others have said that the earliest grammarian would have been Ibn Abi Ishaq (died AD 735/6, AH 117). The schools of Basra and Kufa further developed grammatical rules in the late 8th century with the rapid rise of Islam. From the school of Basra, generally regarded as being founded by Abu Amr ibn al-Ala, two representatives laid important foundations for the field: Al-Khalil ibn Ahmad al-Farahidi authored the first Arabic dictionary and book of Arabic prosody, and his student Sibawayh authored the first book on theories of Arabic grammar. From the school of Kufa, Al-Ru'asi is universally acknowledged as the founder, though his own writings are considered lost, with most of the school's development undertaken by later authors. The efforts of al-Farahidi and Sibawayh consolidated Basra's reputation as the analytic school of grammar, while the Kufan school was regarded as the guardian of Arabic poetry and Arab culture. The differences were polarizing in some cases, with early Muslim scholar Muhammad ibn `Isa at-Tirmidhi favoring the Kufan school due to its concern with poetry as a primary source. Early Arabic grammars were more or less lists of rules, without the detailed explanations which would be added in later centuries. The earliest schools were different not only in some of their views on grammatical disputes, but also their emphasis. The school of Kufa excelled in Arabic poetry and exegesis of the Qur'an, in addition to Islamic law and Arab genealogy. The more rationalist school of Basra, on the other hand, focused more on the formal study of grammar. al-lughah اَللُّغَة (language/lexicon) concerned with collecting and explaining vocabulary. at-taṣrīf اَلتَّصْرِيف (morphology) determining the form of the individual words. an-naḥw اَلنَّحْو (syntax) primarily concerned with inflection (i‘rāb). al-ishtiqāq اَلاشْتِقَاق (derivation) examining the origin of the words. al-balāghah اَلْبَلَاغَة (rhetoric) which elucidates stylistic quality, or eloquence. The grammar or grammars of contemporary varieties of Arabic are a different question. Said M. Badawi, an expert on Arabic grammar, divided Arabic grammar into five different types based on the speaker's level of literacy and the degree to which the speaker deviated from Classical Arabic. Badawi's five types of grammar from the most colloquial to the most formal are Illiterate Spoken Arabic (عَامِّيَّة اَلْأُمِّيِّين ‘āmmīyat al-ummiyyīn), Semi-literate Spoken Arabic (عَامِّيَّة اَلْمُتَنَوِّرِين ‘āmmīyat al-mutanawwirīn), Educated Spoken Arabic (عَامِّيَّة اَلْمُثَقَّفِين ‘āmmīyat al-muthaqqafīn), Modern Standard Arabic (فُصْحَى اَلْعَصْر fuṣḥá l-‘aṣr), and Classical Arabic (فُصْحَى اَلتُّرَاث fuṣḥá t-turāth). Classical Arabic has 28 consonantal phonemes, including two semi-vowels, which constitute the Arabic alphabet. It also has six vowel phonemes (three short vowels and three long vowels). These appear as various allophones, depending on the preceding consonant. Short vowels are not usually represented in the written language, although they may be indicated with diacritics. Word stress varies from one Arabic dialect to another. A rough rule for word-stress in Classical Arabic is that it falls on the penultimate syllable of a word if that syllable is closed, and otherwise on the antepenultimate. Hamzat al-waṣl (هَمْزَة اَلْوَصْل), elidable hamza, is a phonetic object prefixed to the beginning of a word for ease of pronunciation, since Literary Arabic doesn't allow consonant clusters at the beginning of a word. Elidable hamza drops out as a vowel, if a word is preceding it. This word will then produce an ending vowel, "helping vowel" to facilitate pronunciation. This short vowel may be, depending on the preceding vowel, a fatḥah (فَتْحَة‎: ـَ ), pronounced as /a/; a kasrah (كَسْرَة‎: ـِ ), pronounced as /i/; or a ḍammah (ضَمَّة‎: ـُ ), pronounced as /u/. If the preceding word ends in a sukūn (سُكُون), meaning that it is not followed by a short vowel, the hamzat al-waṣl assumes a kasrah /i/. The symbol ـّ (شَدَّة‎ shaddah) indicates gemination or consonant doubling. See more in Tashkīl. In Classical Arabic and Modern Standard Arabic (MSA), nouns and adjectives are declined, according to case (i‘rāb), state (definiteness), gender and number. In colloquial or spoken Arabic, there are a number of simplifications such as the loss of certain final vowels and the loss of case. A number of derivational processes exist for forming new nouns and adjectives. Adverbs can be formed from adjectives. In Arabic, personal pronouns have 12 forms. In singular and plural, the 2nd and 3rd persons have separate masculine and feminine forms, while the 1st person does not. In the dual, there is no 1st person, and only a single form for each 2nd and 3rd person. Traditionally, the pronouns are listed in the order 3rd, 2nd, 1st. Informal Arabic tends to avoid the dual forms antumā أَنْتُمَا and humā هُمَا. The feminine plural forms antunna أَنْتُنَّ and hunna هُنَّ are likewise avoided, except by speakers of conservative colloquial varieties that still possess separate feminine plural pronouns. To the construct state of nouns, where they have the meaning of possessive demonstratives, e.g. "my, your, his"
To verbs, where they have the meaning of direct object pronouns, e.g. "me, you, him"
To prepositions, where they have the meaning of objects of the prepositions, e.g. "to me, to you, to him"
If the personal pronoun -ī is added to a word ending in a vowel (e.g. رَأَيْتَ raʼayta "you saw"), an extra -n- is added between the word and the enclitic form to avoid a hiatus between the two vowels (رَأَيْتَـــنِي raʼayta-nī "you saw me"). Most of them are clearly related to the full personal pronouns. For all but the first person singular, the same forms are used regardless of the part of speech of the word attached to. In the third person masculine singular, -hu occurs after the vowels u or a (-a, -ā, -u, -ū, -aw), while -hi occurs after i or y (-i, -ī, -ay). The same alternation occurs in the third person dual and plural. From ‏كِتَاب‎ kitāb "book", pl. كُتُب kutub: kitāb-ī "my book" (all cases), kutub-ī "my books" (all cases), kitābā-ya "my two books (nom. )", kitābay-ya "my two books (acc./gen.)" Prepositions use -ī/-ya, even though in this case it has the meaning of "me" (rather than "my"). The "sisters of inna" can use either form (e.g. إِنَّنِي inna-nī or إِنِي inn-ī), but the longer form (e.g. إِنَّنِي inna-nī) is usually preferred. The second-person masculine plural past tense verb ending -tum changes to the variant form -tumū before enclitic pronouns, e.g. كَتَبْتُمُوهُ katab-tumū-hu "you (masc. pl.) wrote it (masc.)". إِلَى ilá "to" and عَلَى ‘alá "on" have irregular combining forms إِلَيْـ ilay-, عَلَيْـ ‘alay-; but other pronouns with the same base form are regular, e.g. مَعَ ma‘a "with". لِـ li- "to" has an irregular combining form la-, but بِـ bi- "in, with, by" is regular. مِنْ min "from" and عَنْ ‘an "on" double the final n before -ī. In a less formal Arabic, as in many spoken dialects, the endings -ka, -ki, -hu are pronounced as -ak, -ik, -uh, swallowing all short case endings. Short case endings are often dropped even before consonant-initial endings, e.g. kitāb-ka "your book" (all cases), bayt-ka "your house" (all cases), kalb-ka "your dog" (all cases). When this produces a difficult cluster, either the second consonant is vocalized, to the extent possible (e.g. ism-ka "your name", with syllabic m similar to English "bottom"), or an epenthetic vowel is inserted (e.g. isim-ka or ismi-ka, depending on the behavior of the speaker's native variety). The dual forms are only used in very formal Arabic. Some of the demonstratives (hādhā, hādhihi, hādhāni, hādhayni, hā’ulā’i, dhālika, and ulā’ika) should be pronounced with a long ā, although the unvocalised script is not written with alif (ا). Instead of an alif, they have the diacritic ـٰ (dagger alif: أَلِف خَنْجَرِيَّة alif khanjarīyah), which doesn't exist on Arabic keyboards and is seldom written, even in vocalised Arabic. Note that the demonstrative and relative pronouns were originally built on this word. hādhā, for example, was originally composed from the prefix hā- 'this' and the masculine accusative singular dhā; similarly, dhālika was composed from dhā, an infixed syllable -li-, and the clitic suffix -ka 'you'. These combinations had not yet become completely fixed in Qur'anic Arabic and other combinations sometimes occurred, e.g. dhāka, dhālikum. Similarly, the relative pronoun alladhī was originally composed based on the genitive singular dhī, and the old Arabic grammarians noted the existence of a separate nominative plural form alladhūna in the speech of the Hudhayl tribe in Qur'anic times. This word also shows up in Hebrew, e.g. masculine זה zeh (cf. dhī), feminine זאת zot (cf. dhāt-), plural אלה eleh (cf. ulī). Note that the relative pronoun agrees in gender, number and case, with the noun it modifies—as opposed to the situation in other inflected languages such as Latin and German, where the gender and number agreement is with the modified noun, but the case marking follows the usage of the relative pronoun in the embedded clause (as in formal English "the man who saw me" vs. "the man whom I saw"). When the relative pronoun serves a function other than the subject of the embedded clause, a resumptive pronoun is required: اَلَّرَجُلُ ٱلَّذِي تَكَلَّمْتُ مَعَهُ al-rajul(u) (a)lladhī takallamtu ma‘a-hu, literally "the man who I spoke with him". The relative pronoun is normally omitted entirely when an indefinite noun is modified by a relative clause: رَجُلٌ تَكَلَّمْتُ مَعَهُ rajul(un) takallamtu ma‘a-h(u) "a man that I spoke with", literally "a man I spoke with him". The third-person -hi, -him variants disappear. On the other hand, the first person -nī/-ī/-ya variation is preserved exactly (including the different circumstances in which these variants are used), and new variants appear for many forms. For example, in Egyptian Arabic, the second person feminine singular appears either as -ik or -ki depending on various factors (e.g. the phonology of the preceding word); likewise, the third person masculine singular appears variously as -u, -hu, or - (no ending, but stress is moved onto the preceding vowel, which is lengthened). Other varieties instead use a separate Classical pseudo-pronoun īyā- for direct objects (but in Hijazi Arabic the resulting construct fuses with a preceding verb). Affixation of dual and sound plural nouns has largely vanished. Instead, all varieties possess a separate preposition with the meaning of "of", which replaces certain uses of the construct genitive (to varying degrees, depending on the particular variety). In Moroccan Arabic, the word is dyal (also d- before a noun), e.g. l-kitab dyal-i "my book", since the construct-state genitive is mostly unproductive. Egyptian Arabic has bitā‘ , which agrees in gender and number with the preceding noun (feminine bitā‘it/bita‘t, plural bitū‘ ). In Egyptian Arabic, the construct-state genitive is still productive, hence either kitāb-i or il-kitāb bitā‘-i can be used for "my book", but only il-mu‘allimūn bitū‘-i "my teachers". The declined relative pronoun has vanished. In its place is an indeclinable particle, usually illi or similar. Various forms of the demonstrative pronouns occur, usually shorter than the Classical forms. For example, Moroccan Arabic uses ha l- "this", dak l-/dik l-/duk l- "that" (masculine/feminine/plural). Egyptian Arabic is unusual in that the demonstrative follows the noun, e.g. il-kitāb da "this book", il-binti di "this girl". Some of the independent pronouns have slightly different forms compared with their Classical forms. For example, usually forms similar to inta, inti "you (masc./fem. sg.)" occur in place of anta, anti, and (n)iḥna "we" occurs in place of naḥnu. Numbers behave in a quite complicated fashion. wāḥid- "one" and ithnān- "two" are adjectives, following the noun and agreeing with it. thalāthat- "three" through ‘asharat- "ten" require a following noun in the genitive plural, but disagree with the noun in gender, while taking the case required by the surrounding syntax. aḥada ‘asharah "eleven" through tis‘ata ‘asharah "nineteen" require a following noun in the accusative singular, agree with the noun in gender, and are invariable for case, except for ithnā ‘asharah/ithnay ‘ashara "twelve". The formal system of cardinal numerals, as used in Classical Arabic, is extremely complex. The system of rules is presented below. In reality, however, this system is never used: Large numbers are always written as numerals rather than spelled out, and are pronounced using a simplified system, even in formal contexts. Formal: أَلْفَانِ وَتِسْعُمِئَةٍ وَٱثْنَتَا عَشْرَةَ سَنَةً alfāni wa-tis‘u mi’atin wa-thnatā ‘asharatan sanatan "2,912 years"
Formal: بَعْدَ أَلْفَيْنِ وَتِسْعِمِئَةٍ وَٱثْنَتَيْ عَشْرَةَ سَنَةً ba‘da alfayni wa-tis‘i mi’atin wa-thnatay ‘asharatan sanatan "after 2,912 years"
Spoken: بعدَ) ألفين وتسعمئة واثنتا عشرة سنة) (ba‘da) alfayn wa-tis‘ mīya wa-ithna‘shar sana(tan) "(after) 2,912 years"
Cardinal numerals (اَلْأَعْدَاد اَلْأَصْلِيَّة al-a‘dād al-aṣlīyah) from 0-10. Zero is ṣifr, from which the words "cipher" and "zero" are ultimately derived. The endings in brackets are dropped in less formal Arabic and in pausa. ة (tā’ marbūṭah) is pronounced as simple /a/ in these cases. If a noun ending in ة is the first member of an idafa, the ة is pronounced as /at/, while the rest of the ending is not pronounced. اِثْنَانِ ithnān(i) is changed to اِثْنَيْنِ ithnayn(i) in oblique cases. This form is also commonly used in a less formal Arabic in the nominative case. The numerals 1 and 2 are adjectives. Thus they follow the noun and agree with gender. Numerals 3–10 have a peculiar rule of agreement known as polarity: A feminine referrer agrees with a numeral in masculine gender and vice versa, e.g. thalāthu fatayātin (ثَلَاثُ فَتَيَاتٍ) "three girls". The noun counted takes indefinite genitive plural (as the attribute in a genitive construct). Numerals 11 and 13–19 are indeclinable for case, perpetually in the accusative. Numbers 11 and 12 show gender agreement in the ones, and 13-19 show polarity in the ones. Number 12 also shows case agreement, reminiscent of the dual. The gender of عَشَر in numbers 11-19 agrees with the counted noun (unlike the standalone numeral 10 which shows polarity). The counted noun takes indefinite accusative singular. The numbers 20-99 are expressed with the units preceding the tens. There is agreement in gender with the numerals 1 and 2, and polarity for numerals 3–9. The whole construct is followed by the accusative singular indefinite. mi’at- "100" and alf- "1,000" can themselves be modified by numbers (to form numbers such as 200 or 5,000) and will be declined appropriately. For example, mi’atāni "200" and alfāni "2,000" with dual endings; thalāthatu ālāfin "3,000" with alf in the plural genitive, but thalāthu mi’atin "300" since mi’at- appears to have no plural. In compound numbers, the number formed with the last two digits dictates the declension of the associated noun, e.g. 212, 312, and 54,312 would all behave like 12. أَلْفٌ وَتِسْعُ مِئَةٍ وَتِسْعُ سِنِينَ alfun wa-tis‘u mi’atin wa-tis‘u sinīna "1,909 years"
بَعْدَ أَلْفٍ وَتِسْعِ مِئَةٍ وَتِسْعِ سِنِينَ ba‘da alfin wa-tis‘i mi’atin wa-tis‘i sinīna "after 1,909 years"
أَرْبَعَةٌ وَتِسْعُونَ أَلْفًا وَثَمَانِي مِئَةٍ وَثَلَاثٌ وَسِتُّونَ سَنَةً arba‘atun wa-tis‘ūna alfan wa-thamānī mi’atin wa-thalāthun wa-sittūna sanatan "94,863 years"
بَعْدَ أَرْبَعَةٍ وَتِسْعِينَ أَلْفًا وَثَمَانِي مِئَةٍ وَثَلَاثٍ وَسِتِّينَ سَنَةً ba‘da arba‘atin wa-tis‘īna alfan wa-thamānī mi’atin wa-thalāthin wa-sittīna sanatan "after 94,863 years"
اِثْنَا عَشَرَ أَلْفًا وَمِئَتَانِ وَٱثْنَتَانِ وَعِشْرُونَ سَنَةً iṯnā ‘ašara alfan wa-mi’atāni wa-thnatāni wa-‘ishrūna sanatan "12,222 years"
بَعْدَ ٱثْنَيْ عَشَرَ أَلْفًا وَمِئَتَيْنِ وَٱثْنَتَيْنِ وَعِشْرُونَ سَنَةً ba‘da thnay ‘ashara alfan wa-mi’atayni wa-thnatayni wa-‘ishrīna sanatan "after 12,222 years"
اِثْنَا عَشَرَ أَلْفًا وَمِئَتَانِ وَسَنَتَانِ ithnā ‘ashara alfan wa-mi’atāni wa-sanatāni "12,202 years"
بَعْدَ ٱثْنَيْ عَشَرَ أَلْفًا وَمِئَتَيْنِ وَسَنَتَيْنِ ba‘da thnay ‘ashara alfan wa-mi’atayni wa-sanatayni "after 12,202 years"
alfu laylatin wa-laylatun "1,001 nights"
mi’atu kitabin wa-kitābāni "102 books"
Fractions of a whole smaller than "half" are expressed by the structure fi‘l (فِعْل) in the singular, af‘āl (أَفْعَال) in the plural. m. أَوَّلُ awwalu, f. أُولَى ūlá "first"
m. ثَانٍ thānin (definite form: اَلثَّانِيُ al-thānī), f. ثَانِيَةٌ thāniyatun "second"
m. ثَالِثٌ thālithun, f. ثَالِثَةٌ thālithatun "third"
m. رَابِعٌ rābi‘un, f. رَابِعَةٌ rābi‘atun "fourth"
m. خَامِسٌ khāmisun, f. خَامِسَةٌ khāmisatun "fifth"
m. سَادِسٌ sādisun, f. سَادِسَةٌ sādisatun "sixth"
m. سَابِعٌ sābi‘un, f. سَابِعَةٌ sābi‘atun "seventh"
m. ثَامِنٌ thāminun, f. ثَامِنَةٌ thāminatun "eighth"
m. تَاسِعٌ tāsi‘un, f. تَاسِعَةٌ tāsi‘atun "ninth"
m. عَاشِرٌ ‘āshirun, f. عَاشِرَةٌ ‘āshiratun "tenth"
They are adjectives, hence there is agreement in gender with the noun, not polarity as with the cardinal numbers. Note that "sixth" uses a different, older root than the number six. Arabic verbs (فعل fi‘l), like the verbs in other Semitic languages, are extremely complex. Verbs in Arabic are based on a root made up of three or four consonants (called a triliteral or quadriliteral root, respectively). The set of consonants communicates the basic meaning of a verb, e.g. k-t-b 'write', q-r-’ 'read', ’-k-l 'eat'. Changes to the vowels in between the consonants, along with prefixes or suffixes, specify grammatical functions such as tense, person and number, in addition to changes in the meaning of the verb that embody grammatical concepts such as mood (e.g. indicative, subjunctive, imperative), voice (active or passive), and functions such as causative, intensive, or reflexive. Since Arabic lacks an auxiliary verb "to have", constructions using li-, ‘inda, and ma‘a with the pronominal suffixes are used to describe possession. For example: عنده بيت (ʿindahu bayt) - literally: At him (is) a house. → He has a house. For the negation of Arabic verbs, see Negation in Arabic. There are two types of prepositions, based on whether they arise from the triconsonantal roots system or not. There are ten 'true prepositions' (حُرُوف اَلْجَرّ ḥurūf al-jarr) that do not stem from the triconsonantal roots. These true prepositions cannot have prepositions preceding them, in contrast to the derived triliteral prepositions. True prepositions can also be used with certain verbs to convey a particular meaning. For example, بَحَثَ baḥatha means "to discuss" as a transitive verb, but can mean "to search for" when followed by the preposition عَنْ ‘an, and "to do research about" when followed by فِي fī. The prepositions arising from the triliteral root system are called "adverbs of place and time" in the native tradition (ظُرُوف مَكَان وَظُرُوف زَمَان ẓurūf makān wa-ẓurūf zamān) and work very much in the same way as the 'true' prepositions. A noun following a preposition takes the genitive case. However, prepositions can take whole clauses as their object too if succeeded by the conjunctions أَنْ ’an or أَنَّ ’anna, in which case the subject of the clause is in the nominative or the accusative respectively. This is a question that does not have a clear answer: A حَرْف is by definition مَبْنِيّ, which means that it always (no matter what position or case) stays the same; e.g., the word فِي. There is a debate going on but most grammarians think that مَعَ 'with' is an اِسْم because the word مَعَ can sometimes have nunation (تَنْوِين). For example, in the expression They came together: جاؤوا مَعًا. That is why مَعَ is occasionally listed under "semi-prepositions," as مَعَ treated as an اِسْم is grammatically speaking a ظَرْف مَكَان or زَمَان (adverb of time or place), so called: اِسْمٌ لِمَكَانِ الاِصْطِحَابِ أَوْ وَقْتِهِ. A noun may be defined more precisely by adding another noun immediately afterwards. In Arabic grammar, this is called إِضَافَة iḍāfah ("annexation, addition") and in English is known as the "genitive construct", "construct phrase", or "annexation structure". The first noun must be in the construct form while, when cases are used, the subsequent noun must be in the genitive case. The construction is typically equivalent to the English construction "(noun) of (noun)". This is a very widespread way of forming possessive constructions in Arabic, and is typical of a Semitic language. بِنْتٌ حَسَنٍ bintu Hasanin "the daughter of Hasan/Hasan's daughter". دَارُ الّسَلاَمِ dāru as-salāmi "the house of peace". كِيلُو مَوْزٍ kīlū mawzin "a kilo of bananas". بَيْتُ رَجُلٍ baytu rajulin "the house of a man/a man's house". بَيْتُ ٱلرَّجُلِ baytu r-rajuli "the house of the man/the man's house". The range of relationships between the first and second elements of the idafah construction is very varied, though it usually consists of some relationship of possession or belonging. In the case of words for containers, the idāfah may express what is contained: فِنْجَانُ قَهْوَةٍ finjānu qahwatin "a cup of coffee". The idāfah may indicate the material something is made of: خَاتَمُ خَشَبٍ khātamu khashabin "a wooden ring, ring made of wood". In many cases the two members become a fixed coined phrase, the idafah being used as the equivalent of a compound noun used in some Indo-European languages such as English. Thus بَيْتُ ٱلطَّلَبَةِ baytu al-ṭalabati can mean "house of the (certain, known) students", but is also the normal term for "the student hostel". Classical Arabic tends to prefer the word order VSO (verb before subject before object) rather than SVO (subject before verb). Verb initial word orders like in Classical Arabic are relatively rare across the world's languages, occurring only in a few language families including Celtic, Austronesian, and Mayan. The alternation between VSO and SVO word orders in Arabic results in an agreement asymmetry: the verb shows person, number, and gender agreement with the subject in SVO constructions but only gender (and possibly person) agreement in VSO, to the exclusion of number. Despite the fact that the subject in the latter two above examples is plural, the verb lacks plural marking and instead surfaces as if it was in the singular form. Though early accounts of Arabic word order variation argued for a flat, non-configurational grammatical structure, more recent work has shown that there is evidence for a VP constituent in Arabic, that is, a closer relationship between verb and object than verb and subject. This suggests a hierarchical grammatical structure, not a flat one. An analysis such as this one can also explain the agreement asymmetries between subjects and verbs in SVO versus VSO sentences, and can provide insight into the syntactic position of pre- and post-verbal subjects, as well as the surface syntactic position of the verb. In the present tense, there is no overt copula in Arabic. In such clauses, the subject tends to precede the predicate, unless there is a clear demarcating pause between the two, suggesting a marked information structure. It is a matter of debate in Arabic literature whether there is a null present tense copula which syntactically precedes the subject in verbless sentences, or whether there is simply no verb, only a subject and predicate. Subject pronouns are normally omitted except for emphasis or when using a participle as a verb (participles are not marked for person). Because the verb agrees with the subject in person, number, and gender, no information is lost when pronouns are omitted. Auxiliary verbs precede main verbs, prepositions precede their objects, and nouns precede their relative clauses. Adjectives follow the noun they are modifying, and agree with the noun in case, gender, number, and state: For example, بِنْتٌ جَمِيلَةٌ bintun jamīlatun 'a beautiful girl' but اَلْبِنُتُ ٱلْجَمِيلَةُ al-bintu al-jamīlatu 'the beautiful girl'. (Compare اَلْبِنْتُ جَمِيلَةٌ al-bintu jamīlatun 'the girl is beautiful'.) Elative adjectives, however, usually don't agree with the noun they modify, and sometimes even precede their noun while requiring it to be in the genitive case. The subject of a sentence can be topicalized and emphasized by moving it to the beginning of the sentence and preceding it with the word إِنَّ inna 'indeed' (or 'verily' in older translations). An example would be إِنَّ ٱلسَّمَاءَ زَرْقَاءُ inna s-samā’a zarqā’(u) 'The sky is blue indeed'. ’Inna, along with its related terms (or ‏أَخَوَات‎ ’akhawāt "sister" terms in the native tradition) ‏أَنَّ‎ anna 'that' (as in "I think that ..."), inna 'that' (after ‏قَالَ‎ qāla 'say'), ‏وَلٰكِنَّ‎ (wa-)lākin(na) 'but' and ‏كَأَنَّ‎ ka-anna 'as if' introduce subjects while requiring that they be immediately followed by a noun in the accusative case, or an attached pronominal suffix. As a particle, al- does not inflect for gender, number, person, or grammatical case. The sound of the final -l consonant, however, can vary; when followed by a sun letter such as t, d, r, s, n and a few others, it is replaced by the sound of the initial consonant of the following noun, thus doubling it. For example: for "the Nile", one does not say al-Nīl, but an-Nīl. When followed by a moon letter, like m-, no replacement occurs, as in al-masjid ("the mosque"). This affects only the pronunciation and not the spelling of the article. Some people, especially in the region of Arabia, when they are descended from a famous ancestor, start their last name with آل, a noun meaning "family" or "clan", like the dynasty Al Saud (family of Saud) or Al ash-Sheikh (family of the Sheikh). آل is distinct from the definite article ال. Object pronouns are clitics and are attached to the verb; e.g., أَرَاهَا arā-hā 'I see her'. Possessive pronouns are likewise attached to the noun they modify; e.g., كِتَابُهُ kitābu-hu 'his book'. The definite article اَلـ al- is a clitic, as are the prepositions لِـ li- 'to' and بِـ bi- 'in, with' and the conjunctions كَـ ka- 'as' and فَـ fa- 'then, so'. An overhaul of the native systematic categorization of Arabic grammar was first suggested by the medieval philosopher al-Jāḥiẓ, though it was not until two hundred years later when Ibn Maḍāʾ wrote his Refutation of the Grammarians that concrete suggestions regarding word order and linguistic governance were made. In the modern era, Egyptian litterateur Shawqi Daif renewed the call for a reform of the commonly used description of Arabic grammar, suggesting to follow trends in Western linguistics instead. ^ Goodchild, Philip. Difference in Philosophy of Religion, 2003. Page 153. ^ Archibald Sayce, Introduction to the Science of Language. Pg. 28, 1880. ^ al-Aṣmaʿī at the Encyclopædia Britannica Online. ©2013 Encyclopædia Britannica, Inc.. Accessed 10 June 2013. ^ Sir Hamilton Alexander Rosskeen Gibb, The Encyclopaedia of Islam, pg. 350. Leiden: Brill Archive, 1954. New edition 1980. ^ Alaa Elgibali and El-Said M. Badawi. Understanding Arabic: Essays in Contemporary Arabic Linguistics in Honor of El-Said M. Badawi, 1996. Page 105. ^ Kees Versteegh, The Arabic Language (Edinburgh: Edinburgh University Press, 1997), p. 90. ^ Ryding, Karin C. (2005). A reference grammar of Modern Standard Arabic (6th printing ed.). Cambridge: Cambridge University press. p. 366. ISBN 978-0521777711. ^ Drissner, Gerald (2015). Arabic for Nerds. Berlin, Germany: createspace. p. 64. ISBN 978-1517538385. ^ Drissner, Gerald (2015). Arabic for Nerds. Berlin, Germany: createspace. p. 65. ISBN 978-1517538385. ^ Karin C. Ryding, A Reference Grammar of Modern Standard Arabic (Cambridge: Cambridge University Press, 2005), pp. 205-24 [§8.1]. ^ Adam Pospíšil, 'The Idafa construction in Arabic and its morphosyntactic behaviour' (unpublished BA thesis, Univerzita Karlova v Praze, 2015), §7.1. ^ Karin C. Ryding, A Reference Grammar of Modern Standard Arabic (Cambridge: Cambridge University Press, 2005), pp. 206-11 [§8.1.1]. ^ Benmamoun, Elabbas 1992. “Structural conditions on agreement.” Proceedings of NELS (North-Eastern Linguistic Society) 22: 17-32. ^ Bakir, Murtadha. 1980. 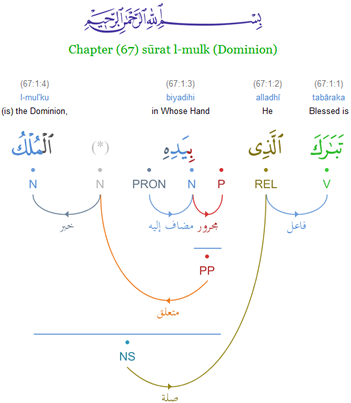 Aspects of clause structure in Arabic. Doctoral dissertation, Indiana University, Bloomington. ^ Fassi Fehri, Abdelkader. 1982. Linguistique Arabe: Forme et Interprétation. Rabat, Morocco, Publications de la Faculté des Lettres et Sciences Humaines. ^ Jelinek, Eloise. 1981. On Defining Categories: Aux and Predicate in Egyptian Colloquial Arabic. Doctoral dissertation. University of Arizona, Tucson. ^ Fassi Fehri, Abdelkader. 1993. Issues in the Structure of Arabic Clauses and Words. Dordrecht: Kluwer. ^ Shlonsky, Ur 1997. Clause Structure and Word order in Hebrew and Arabic: An Essay in Comparative Semitic Syntax. Oxford: Oxford University Press. ^ Heggie, Lorie. 1988. The Syntax of Copular Structures. Doctoral dissertation. USC, Los Angeles. ^ Benmamoun, Elabbas. 2000. The Feature Structure of Functional Categories: A Comparative Study of Arabic Dialects. Oxford: Oxford University Press. ^ Aoun, Joseph, Elabbas Benmamoun, and Lina Choueiri. 2010. The Syntax of Arabic. Cambridge: Cambridge University Press. ^ Shawqi Daif, Introduction to Ibn Mada's Refutation of the Grammarians (Cairo, 1947), p. 48. ^ "The Emergency of Modern Standard Arabic," by Kees Versteegh. Taken from The Arabic Language by permission of the Edinburgh University Press. 1997.